Nowadays, an action camera is a must-have gadget for adventurous people who love to travel a lot. Action-cam reserves multiple purposes i.e. it is compact can be mounted anywhere quickly, extreme temperatures friendly, and water and dust proof. GoPro is the first name that comes to mind when talking about action and sports cameras because the company is renowned for producing such type of cameras. GoPro cameras are known for their best performance, extreme portability, and distinctive styles. Therefore, the company takes advantage of their name and popularity, and the prices of their cameras are relatively higher than other action cameras in the market. Apple is one such popular brand which charges a lot for its products. Same is the case with GoPro; they charge for their name and the trust they have gained over the past years. But this does not make their cameras the only considerable choice in the world of action cameras. In this guide, I have compiled a list of best GoPro alternatives that are quite close to GoPro concerning capabilities and performance. Moreover, these cameras are relatively cheaper. The action cameras just like all other gadgets are advancing with the growing technology regarding their hardware and specifications. Therefore, it is necessary to stay up-to-date with the latest innovations and improvements in the tech world if you want to buy one. Accordingly, there are few important things mentioned below that must be taken care of while buying an action-cam. That does not mean you have to fulfill all the requirements; just take care of these points, and you would not be disappointed. Video resolution and quality is the first and most important thing you should take care of while buying yourself an action camera. Right now, 4K (or Ultra High Definition) is the highest video quality offered by such cameras, trailed by 1080p and 720p video qualities respectively. But generally, the Ultra HD video quality cameras are way more expensive than simple HD cameras. In the end, it all depends on which resolution you prefer but also consider that if you have a 4K viewing screen or not. If you do not have 4K supported screen, then buying a camera with 4K video resolution is pointless. Action cameras are mostly mounted on the head or a helmet, therefore, goes for a compact and lighter one that can be worn easily. Moreover, heavy cameras are more likely to be broken easily when dropped. You also have to know your camera usage well before buying it. So must know that whether you want to mount it on your helmet or fix it in front of your racing bike. There are many GoPro alternatives action cameras available in the market with the variety of mounting options. Action cameras have to work all day long. Therefore, you need a compact camera that has a huge battery life too so that it may cover your adventurous journey without dying in the halfway. Anyhow, if the camera you are buying matches your budget and specific requirements but does not have a healthy battery life, then you can keep spare batteries with you. The batteries also come with solar chargers these days. Sometimes, it is necessary for you to have an extra pair of batteries, a tripod stand, a flashlight for night videography and multiple convertible cables. Make sure that the action camera you are buying supports these kinds of add-on accessories that are readily available in the market. Most of the companies ship their products with the manufacturing warranty. They also provide customer support and on-call guidance. Make sure the delicate gadget you are buying has some company warranty and a proper customer support service. To cut short, consider the things mentioned above, read some reviews and suggestion online then make the purchase. 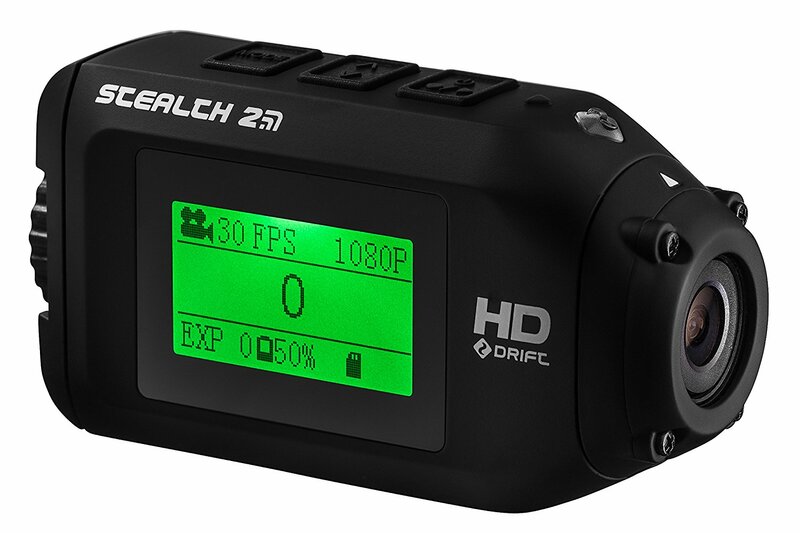 An extreme dual functioning camera that records at full HD 1080p 30FPS and lasts up to 3 hours of recording time. This action shot camera that is 40% percent lighter and is half the size of a normal digital camera. 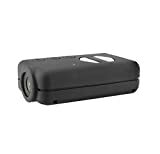 A 137 degrees lens view provides the most accurate and the sharpest image capturing and this drift camera is perfectly suited as a dash camera, and as a sports action camera. 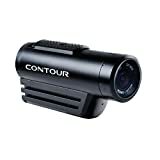 Weather resistant, this little camera is engineered with the most bold and durable materials and will hold its own as an extreme camera mounted as a bike camera or as a helmet camera. The 3hr battery life, rotatable lens and aerodynamic design make the Drift Stealth 2 a unique POV camera. Although this nifty little device characterizes its light-weight as its most compelling feature, it does not lack a good video quality. It can record videos up to 1080p resolution at 30 frames per second and flaunts a bitrate of 18Mbps. That is a decent quality for action cameras, certainly not the best out there, but not a deal breaker either. You can take 3 megapixels single shots, or 3 burst shots per seconds and even pull it out for time lapse photos ranging from .5- to .60- time intervals. Drift Stealth 2 is a real prize when it comes to compactness and lightness. At only 97g, you will fall in love with its incredible portability and the astounding ease it brings to your action photography. Its 80x42x27mm size makes it a friendly camera to go about on your next adventure. If you’re looking for a lightweight, compact camera that can take decent photos and run for a long duration, this is a pretty great solution to your needs. The battery life on this little bad boy is pretty long lasting, but where it can leave you hanging dry is that it is built-in and you can not remove it to replace with an extra. Many action cameras have a removable battery for the obvious reasons of allowing additional backup at times of dire needs. In my opinion, it could have been a lot better with a removable battery. But still, 3 hours battery time is quite decent for action cameras. In fact, it is one of the best GoPro alternatives in the market, and it is hailed for its long battery life. Drift Stealth 2 Sports Action Camera comes with a one-year warranty so you can have some peace of mind on your adventures, for a year at least. It comes with a universal clip that can be used to a helmet or other POV positions. See all specs and features. Recording at 1080p resolution at 30 frames per second and 720p at 60fps, its video quality is just as good as top tier action cameras out there. A 270-degree rotating lens makes Contour ROAM3 an ultimate capture of your most actionable moments. With this incredible rotating lens, never miss out on any detail, and flaunt your actions in front of your friends freely. Its 5MP camera makes sure the quality of the video is superb and includes all the necessary features like single shot, interval photos, and a built-in mic takes care of the sound. Weighing 386g, it is considerably heavier than some of the other GoPro alternatives options I have featured, but it makes up for its weight in extra features as being waterproof (up to 30ft.) without a case. If you spend most of your action time under water, a little extra weight isn’t a deal breaker at all. 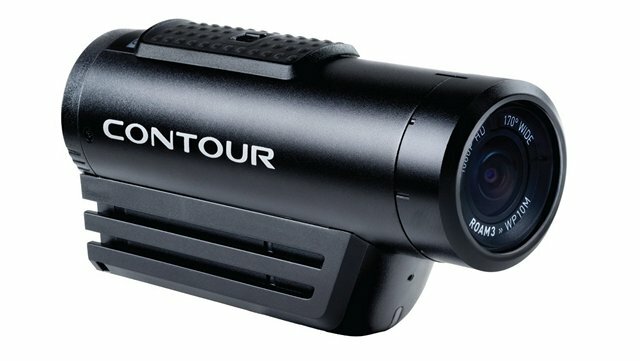 Contour ROAM3 Waterproof Action Camera also has a built-in battery without support for removability. The battery does provide a prolonged 3.5 hours backup, which is on par with industry standards. If you are into action sports like skiing, swimming, biking, and surfboarding, this action camera will fulfill all your needs. It provides mounting options for all these sports. It comes with two choices, a ‘Camera Only’ and a ‘Starter Bundle’ options, as you might have guessed, the former only gives you the camera and the latter come with a charging kit and a flex strap mount along with the camera. See specs and features. 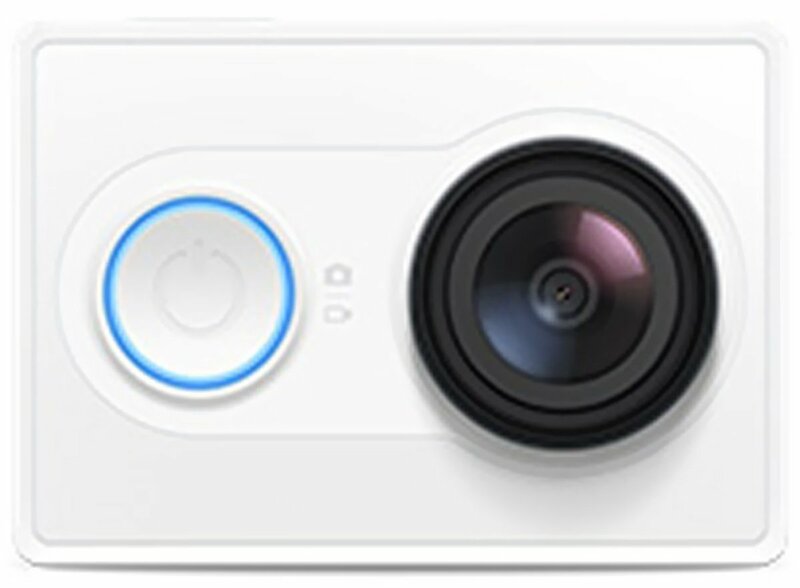 With an 8MP camera with a 124-degree wide angle lens, Polaroid Cube+ action camera records at 1440p with slow and fast motion capturing capability. This makes for a widely diverse, high-quality, incredible looking action camera that is sure to catch everyone’s attention. 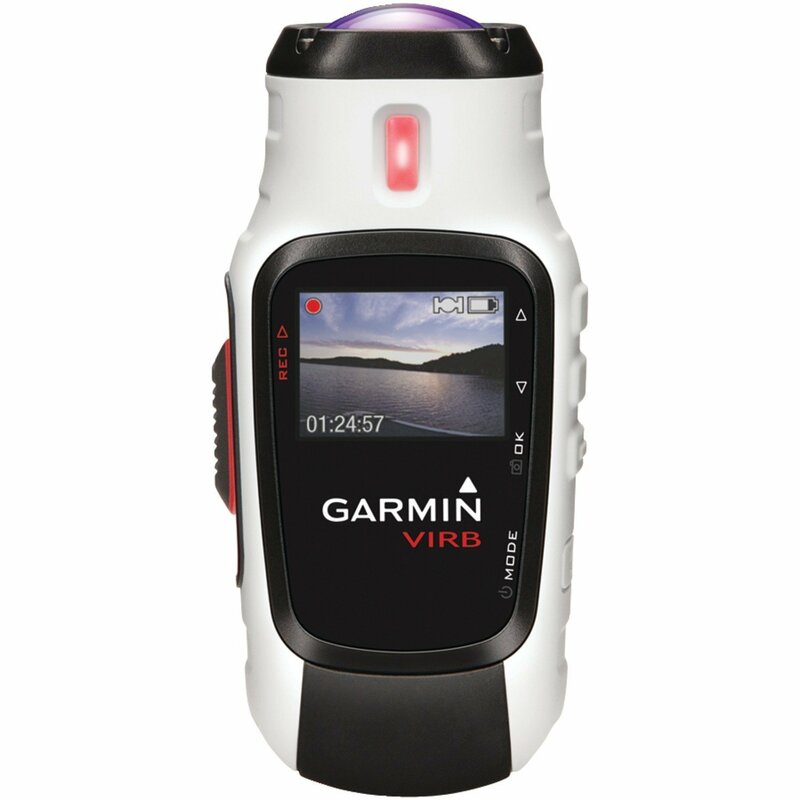 It is waterproof up to 30ft without a case making it a very reliable and high-quality video camera. At only 59g, it is one of the most lightweight GoPro alternatives action cameras out there. The design is aesthetically pleasing, and the size is super-compact, making it a stylishly portable action camera perfect for your next underwater or sky-high adventure. 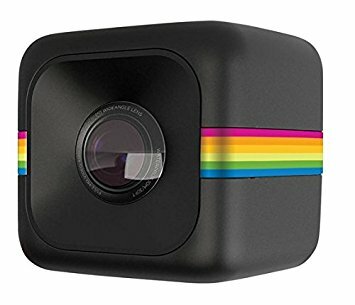 The battery life of Polaroid Cube+ action camera is not impressive. With only an hour’s worth of backup, it lacks other options. If battery life is your primary concern, you might be happier with other options. It has the capability to record while charging, so if you take a power bank with you, problem solved! 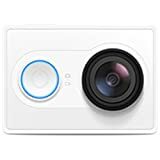 Polaroid Cube+ action camera with WiFi has microUSB port and comes with a bunch of accessories like HDMI cable, helmet mount, handlebar mount, and of course, a USB cable. See all specs and features. Xiaoyi Yi action camera has a whopping 16MP Sony camera with 155-degree wide lens and records 1080p videos at 120 fps. Arguably one of the best GoPro alternatives considering video quality options available at a modest $76.99. At 113g, it is heavier than quite a few other GoPro alternatives option but nonetheless is quite portable. It has a decent compact design suitable for most sports and action activities. A 1,010 mAh battery offers a near 2 hours battery life. The nice thing here is that the battery is removable so you can keep a charged extra battery with you for dire needs. Xiaoyi Yi Action Camera does not come with any mounts out of the box, so you will have to purchase them separately. Read more about its specifications and features. Ultra-Wide Angle Lens No need for a viewfinder. 146 degree ultra-wide view captures everything. Grip Sensor No fumbling with the on/off switch. An automatic sensor detects your grip for instant-on use. One-Button Control Tap for photos, press for videos. Seamless control eliminates the need for a photo/video mode switch. Ergonomic Design Subtle size and form-fitting grip fits your hand naturally for distraction-free use. HTC Re is a peculiarly shaped action camera which looks pretty sleek, but then again, I’ll let you decide if you are happy with its design or not. It is, however, equipped with all necessary action camera features. You can consider it one of the best GoPro alternatives. A 16MP camera that can take 1080p and 720p HD videos with slow-mo options and a 146 degrees viewing angle. HTC Re houses a pretty decent camera for such a small size. HTC Reweighs a mere 66g and as you can see in the image looks like it can fit between your fingers while you ride your bike. Equipped with an 820 mAh battery, it can give you around 1.5 hours of battery life. HTC Re comes with a USB cable and a lanyard. You can purchase the rest of the accessories like mounts etc. separately. See specs and features. Light Weight and Portable: Spytec Mobius Action Camera weighs just 1.2 ounces and it is easy to use, you can virtually carry it everywhere ever you want to. Loop Recording: This feature is very useful if you want to make most of your storage space. The camera will automatically write over your files, so you can keep on shooting. Battery Back up: The battery on the Mobius Action Camera last upto 120 minutes, giving you plenty of time to record your enjoying moments. The video quality of Mobius mini sports cam is not the best out there. With a 3.5MP camera, it takes a blow against the other GoPro alternatives. It records 1080p videos at 30 frames per second and 720p at 60fps. It offers Time-lapse mode also. At a mere 8.5g, this is the lightest GoPro alternatives action camera I have reviewed today. Carrying it around you won’t even feel it. Its feather-like weight and compact size make it a marvelous outside companion. Mobius mini sports action cam also has an 820 mAh battery, which can give you around 1.5 hours of battery life. When it comes to out of the box accessories, Mobius mini sports action cam spares no expense in trying to please its customers. It comes with various mounts like car windshield mount, bike handlebar mount, helmet mount, and Velcro. It also comes with an attachment sleeve, a mini tripod, a car adapter, and apparently, a USB cable. See detailed specs and reviews. SJCAM SJ5000 wide-angle sports action camera is a distinguished alternative to GoPro which houses a lot of cool features. One of them is a 2-inch HD display that lets you view all your recordings and photos. It has a 14MP CMOS camera and a 170-degree wide lens, topped with a 4X zoom to give it top-notch video quality. It records at 1080p and offers all the essential features like time-lapse, burst mode, etc. 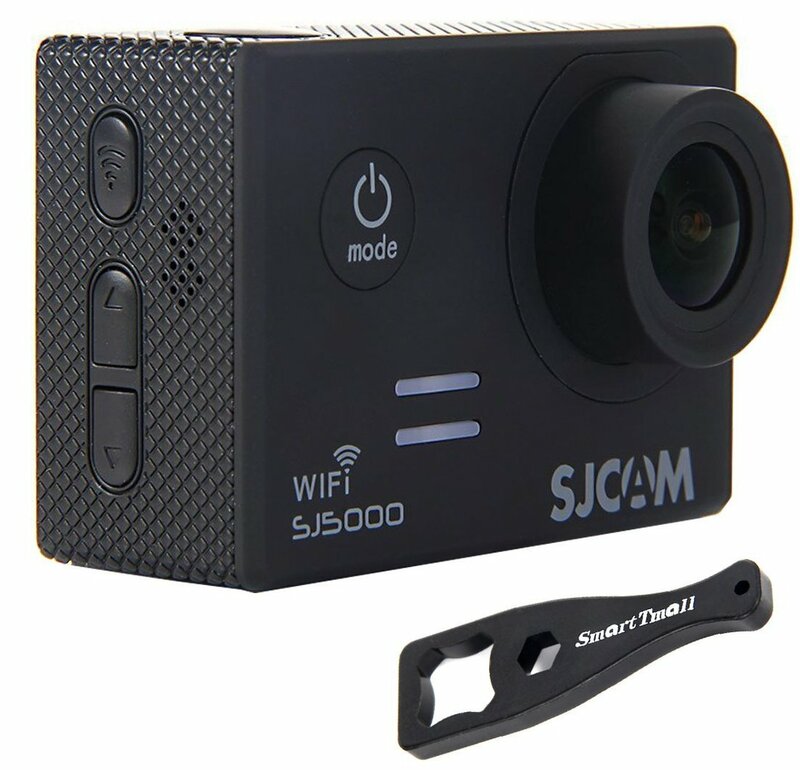 SJCAM SJ500 wide-angle sports action camera has a very compact size and looks kind of sturdy. Although it is heavier than some of the GoPro alternatives action cam models I have reviewed, it isn’t that heavy to make it a deal breaker. You will have to compromise on a modest 900mAh battery on this one. It still gives you around 70 minutes of video recording. But the good thing about this GoPro alternative action camera is that the battery is removable, so you can always keep a spare. SJCAM SJ500 wide-angle sports action camera makes its customers awfully happy with its extended range of accessories that come with the box. These include waterproof case, bicycle stand, helmet base, mounts, tripod adapter and a few more to make it a complete outdoor adventure filming package. Read detailed reviews and specifications. 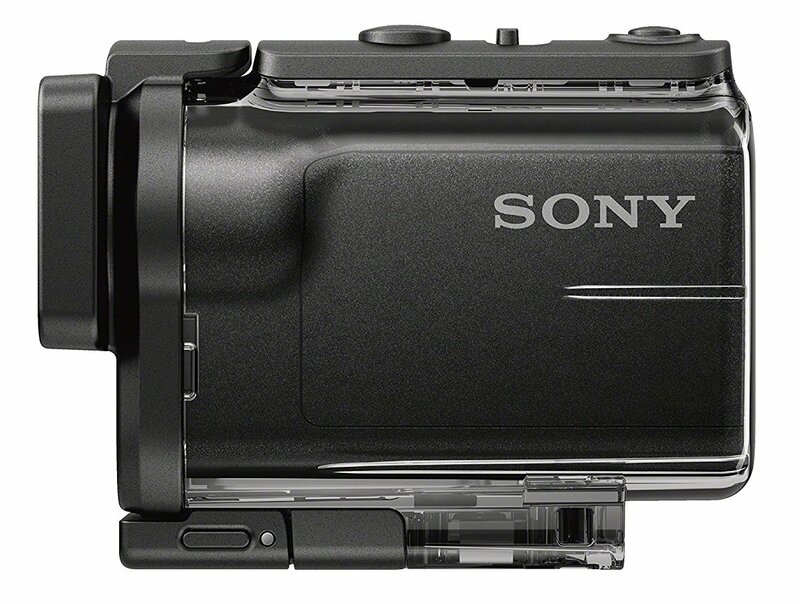 Sony HDR-AS50 full HD action cam has an excellent video quality owing to its image stabilization feature called SteadyShot. It even records at 4K but only for time-lapses and photos. If you are looking for GoPro alternatives with 4K video recording, you might want to check out Sony’s higher end 4K action cams. This one here records video at 1080p and has a lens viewing angle of 170 degrees, pretty much same as the other GoPro alternatives I have reviewed. Weighing 83g, it bolsters a reasonable weight and size – neither too heavy to carry nor too light to get misplaced. With 150 minutes in record time, this battery is one of the best among various best GoPro alternatives action cameras that I have seen. It does not come with a universal tripod mount or any other mount for that matter. You will have to pay extra for accessories. Read more about its features and specifications. The Rollei Actioncam 420 beats other GoPro alternatives action cameras when it comes to extra ease as it comes with a remote that you can wear on your wrist. So, you can take care of all actions with the remote on your wrist. The camera LCD lets you view and control everything happening to it. The built-in Wi-Fi covers the range of more than 15m, and you can control the camera remotely with the iOS and Android applications that the company offers. The company claims that the camera is waterproof up to 40 meters when merged in the water with the shipped waterproof case, but the wrist remote is only water resistant not water proof. The action-cam allows you to shoot videos in 4K (3840 x 2160 Pixel/10 fps), 2K (1920 x 1440 Pixel/30 fps) and Full HD (1920 x 1080 Pixel, 60/50/30/25 fps) video modes with its sharp 12MP camera. You can tilt the camera to 180-degree for the more customized experience. The camera also features a time-lapse mode. It weighs about 65g, and its dimensions are 3.2 x 1.12 x 3.0 inches. This makes it a little lighter than the average action camera weight of 2.70 ounces. The installed battery is 1180 mAh, and it has a battery life of 2 hours when it is new and not much used. 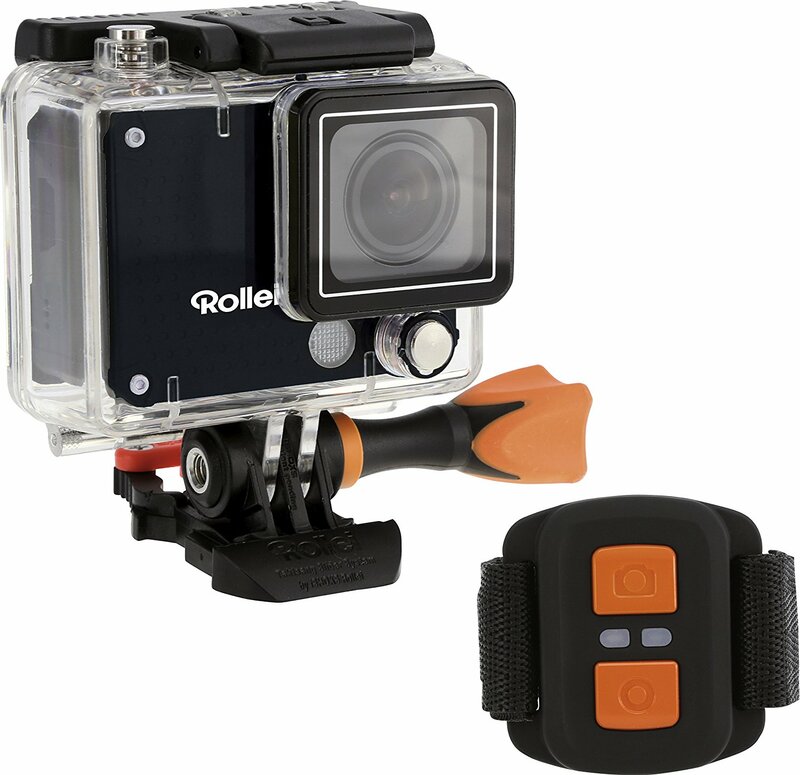 The whole Rollei Actioncam 400 package contains a camera, wrist remote, basic mount, waterproof case, tripod adapter, safety pads and a USB cable. This oddly-shaped little beast offers an incredible 16MP CMOS camera recording at 1080p and a viewing angle of 146 degrees. This should be more than enough for all your action captures. It even has a small 1.4-inch screen to let you preview your videos and photos. The size of this action camera is compact but more vertical than other GoPro alternatives action cameras I have reviewed. Although the weight is considerably higher than other models (172.3g), it is a small price to pay for the extraordinary battery and other features it offers. This one offers a whopping 2,000 mAh battery giving 3 hours of video recording, which is more than any other GoPro alternatives action cameras I have reviewed. If you are looking for a top-notch action camera, that is lightweight, has excellent recording quality, and a great battery life, this one is a no-brainer. It comes with a microUSB cable, mount brackets, curved sticky mount for helmets, a flap mount, and a Garmin sticker to let you show your brand loyalty. This was our guide to best GoPro alternatives action camera you can consider buying in 2017. At the end of the day, it all depends on which action camera you prefer and whether that camera suits you and addresses your budget and needs perfectly or not. But before you jump to buy your favorite action-cam, there are few things you must consider like the video and image quality, device portability and durability, mounting options, battery life, additional accessories and product support. So, shop your favorite action-cam now and start shooting!